Pomegranates have been popping up in my local grocery stores lately and although I love the flavor, I hate the process of getting those tiny arils out of the skin! After hemming and hawing over whether or not to buy one, it hit me. 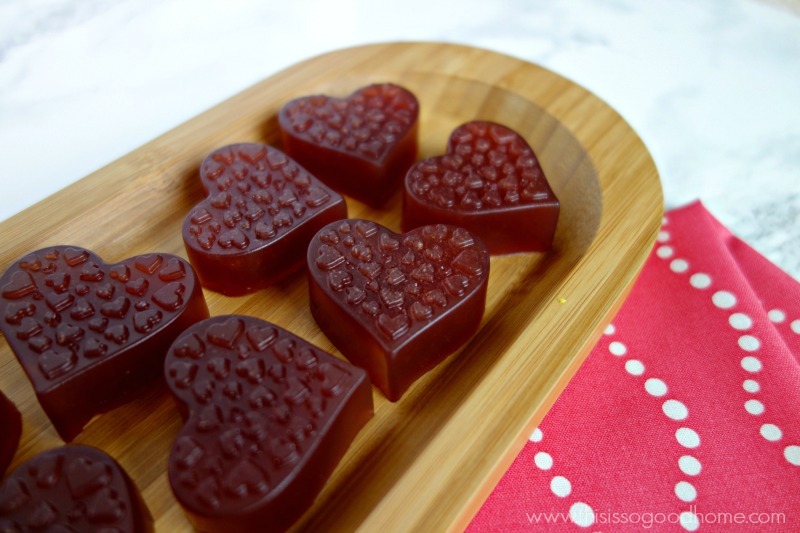 Go the easy route, grab some pomegranate juice, and make some gummy treats! All the flavor of pomegranates without the mess of seeding them. These Pomegranate Ginger Gummies are lightly spiced with fresh ginger and have some Meyer lemon juice for a little tang. I have always loved to make (and eat!) sweet treats. Before making the switch to a whole foods Paleo diet, I would bake something special a couple of times a month. Creating these special treats felt like giving a gift to my husband and my family. So after settling into the Paleo diet, I needed a new way to make a delicious treat that fit within the diet I was now enjoying. 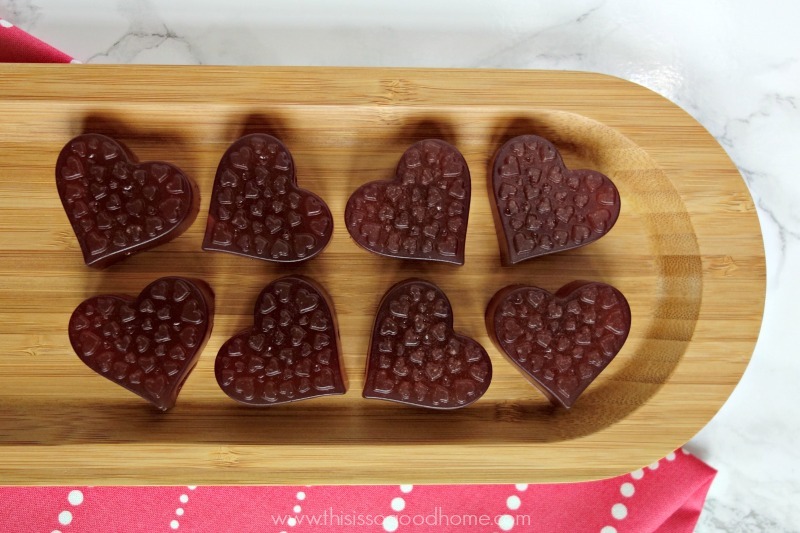 Gummy treats are so easy to make and they are loved by just about everyone – kids and adults alike! Memories of playing with jigglers in fun shapes will put a smile on anyone’s face. What I love most about making these homemade versions is that you can get really creative with the flavors, not to mention controlling the ingredients (*ahem* no food coloring!!). A good, high-quality grass-fed gelatin is the base of all of my gummy treats. Gelatin supports healthy digestion and is often referred to as “nature’s botox” as it will help to strengthen hair, nails, and skin! Gelatin is naturally flavorless so the options for flavoring your gummie treats are endless. I’ve posted a number of different gummie recipes in the past. A few of my favorites include: Mexican Hot Chocolate Gummies, Strawberry Mint Lemonade Gummies, and Creamy Meyer Lemon Gummies. I absolutely love the zing that the ginger adds to the sweet pomegranate flavor in today’s recipe. 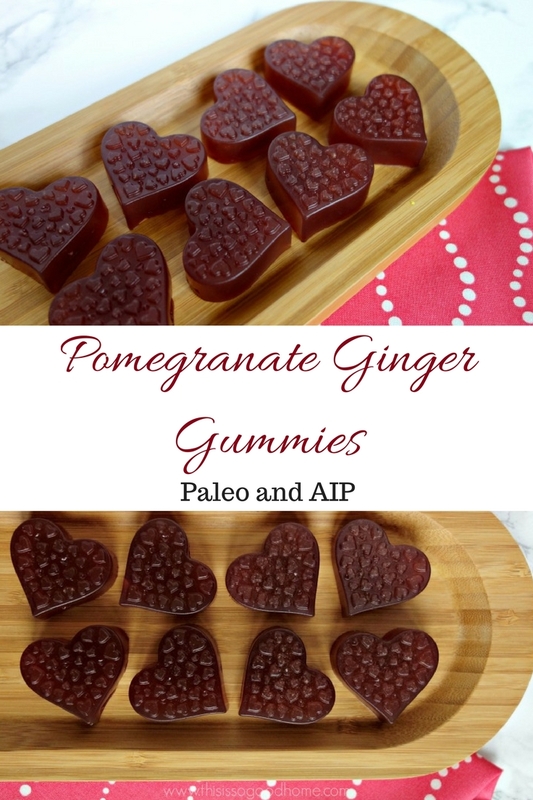 These Pomegranate Ginger Gummies might just be my new favorite! Place the pomegranate juice, lemon juice, water, honey, and ginger in a large saucepan and heat it to barely a simmer. Pour the heated juice mixture into a blender and add the gelatin. Process until all of the gelatin is blended into the liquid. Pour into a decorative molds or into an 8×8 baking dish and place in the refrigerator for a couple of hours. Once the gummies have firmed up, pop them out of the mold or cut them into desired shapes. Enjoy your treats and store leftovers in the refrigerator.